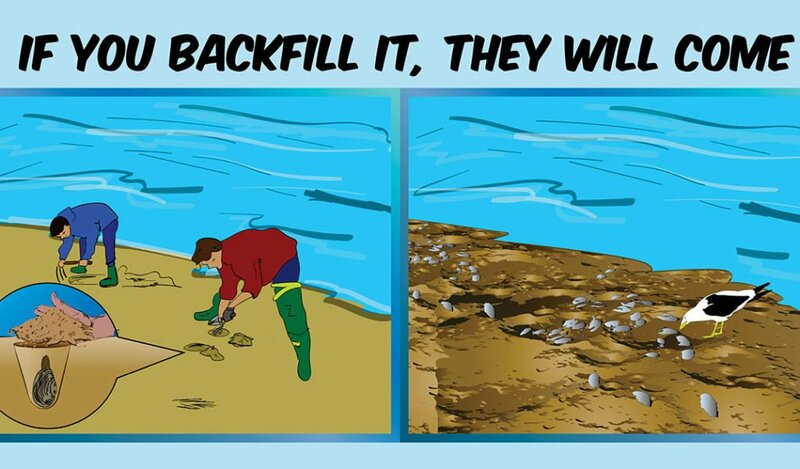 Shellfish Harvesters — Please Fill in Your Holes! Recreational shellfish harvesters sometimes wonder why the Town of Barnstable Department of Natural Resources requires them to fill in holes dug while harvesting clams. Filling in the holes you dig protects both shellfish and people. When someone is using a shovel to dig for clams, the substrate dug from the hole is usually placed in a pile on the beach near the hole. This pile can get quite large. Even if it is small, the pile may not completely wash away or flatten out with the waves or incoming tide. The pile may be covering oysters, clams, or other animals that live in or on the beach. These animals suffocate and die when they cannot take in fresh seawater. Another reason to fill in the holes is to keep people from falling or tripping in them. Even a small hole becomes a hazard when the tide covers it. Someone wading at the water’s edge is likely to take an unexpected dip if they step into the hole or trip at its edge. A hole not covered by the tide can still be an obstacle or cause injury to people with a mobility impairment or people who are not watching where they are walking.